In addition to the usual Mellotron fixing sessions, we got to hear from those in our midst in a few special sessions designed to help us get the most from our precious machines. Pierre talked about his famous keyboard modification. 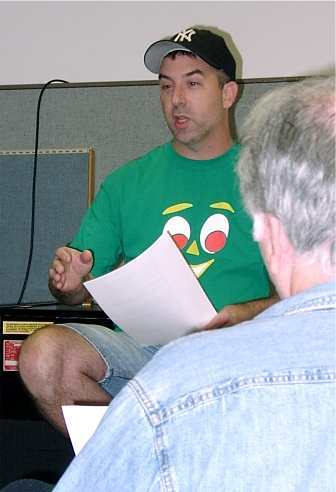 Rick gave a talk about new Mellotron sounds and how to use 'em. 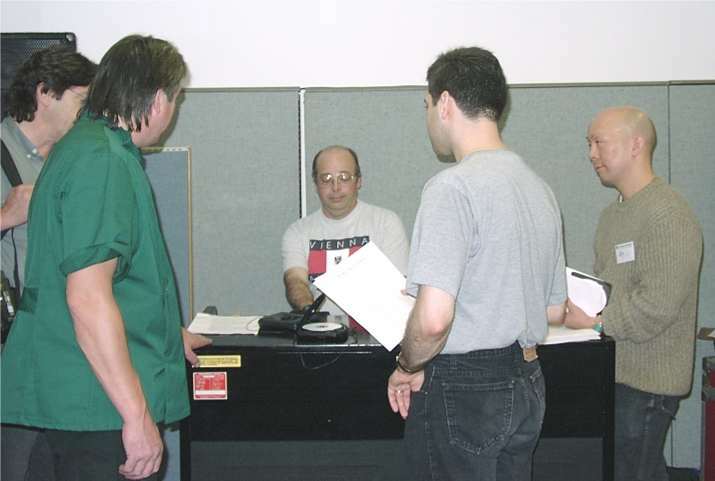 Pierre, Rob C., and Jimmy P.
Pierre Veilleux, a very talented musician who has been into Mellotrons for decades, has always been trying to come up with ways to improve the machines. One improvement is his keyboard modification, which is now used in Dave Kean's Mark VI. 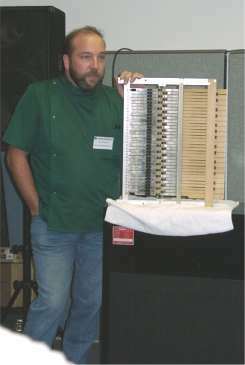 The modification involves taking the pressure pad screw from its point approximately midway along the long pressure pad arms straight across the whole keyboard and moving the screws to the end of the pressure pad arm, much closer to the pressure pad of each pad arm, in a staggered fashion. This results in a Mellotron that plays more like a B3, and it gets rid of the "keyclick" or the sudden percussive chirp when the note starts to play (play the upper octave of the flutes with a fast attack hit on the key, and you'll hear it). In addition, the pinch roller needs maybe half a turn after full-speed to be adjusted properly--not 2 turns--resulting in a much lighter keyboard and less stress on the machine. However, as John Bradley discussed, the down side of this modification is the keyboard is now much more sensitive to the type of tape used. If you get all of your tapes from the same place, then, once adjusted, the keyboard will be fine with this modification. If you have different tape stock, you may find yourself reaching for the screw driver whenever you change your frame out. 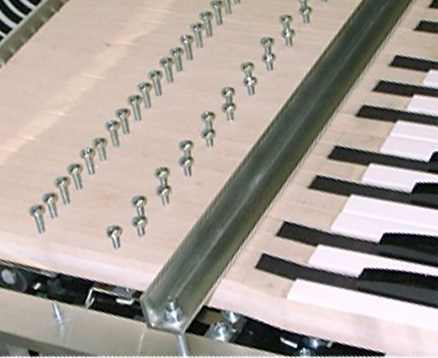 This modification was tried on the pinch rollers, too, but it didn't work for chords. The additional pressure caused the capstan to bend just a little, resulting in wobblies. So it turns out the original design with its built-in pinch roller arm squash was correct. There's just enough "give" in the on the pinch roller arm to allow the 'tron to work fine, so don't go messing about by moving the pinch roller screws around! As mentioned on the Mark VI page, I found the keyboard modification to play a bit "mushy" and not very fast, but that could've been the way the machine was set up or was playing that day. Nonetheless the feel was very consistent all the way long the keyboard. At some point Pierre will have his Mark V (with keyboard modifications) at one of our 'tron-fests, and it'll be really interesting to see how that plays! 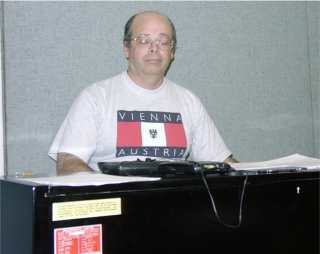 Rick Blechta, a talented musician and arranger in his own right, began his discussion with a break-down of the intro to "Watcher of the Skies," which he painstakingly lifted by ear from the recording (click here for your copy in PDF format (if necessary, download Acrobat Reader to view the document)). If you've been using an arrangement from somewhere else, you will want to check this out. Rick at his Mark II SFX Console, the "Brendatron" Rick talked about the new sounds available for the Mellotron, such as French horn and piccolo, which he helped to produce. They are wonderful sounds, but people have asked Rick why such sounds would be useful and how they'd be used. By hitting two notes of the piccolo, we were treated to a resonating frequency. Rick explained that this happens whenever you get two piccolo players playing along together, and even a single piccolo can create the effect. So one would not normally play chords with the piccolo. That instrument is there for the composer to express something high and clear, a somewhat solo purpose. Some composers write piccolo parts with the resonant frequency in mind, so stacking notes could be useful as well. Ahhh, 3-violins. Everyone agrees they're harsh. So how do you use them correctly? Rick said that we've got to stop thinking like keyboard players. 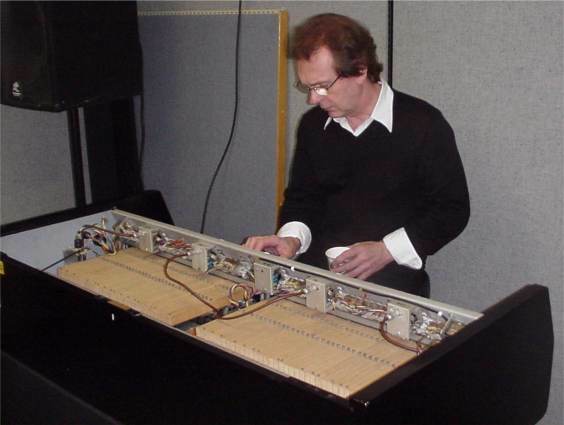 In fact some of the best Mellotron arrangers, as Ian McDonald, aren't keyboard natives. As keyboard players we tend to want to create blocked chords in their standard inversions - C-E-G, E-G-C, G-C-E, y-a-w-n. With a Mellotron the close notes can produce a very thick, solid sound, which does have its use. 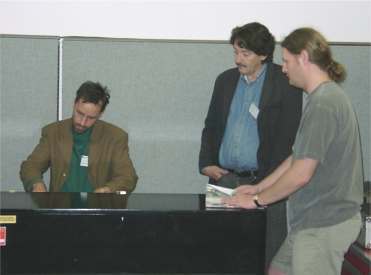 But then Rick demonstrated leaving out a few notes here and there and spreading, say, a major chord across the keyboard, using more than just a single octave. Maybe you wouldn't put the tonic as the lowest note, or you'd leave out a third somewhere. As he demonstrated the technique with 3-violins, you could hear the sound open up and become more clear and more interesting, and a wide variety of possibilities became apparent. By thinking more like an orchestral arranger than a keyboard player, the Mellotron sounds, especially the new ones created by Rick and others, can find their place in your mix without becoming muddy or lost. Flutes don't play chords, so think for a second when you reach for that C major in the first inversion on your Bradley B set! But, by all means, if you find something that works for you, use it! Rick just wanted to wake us up to some new ways of looking at things, and he did a cracking job. Fritz Doddy put together a list of hints for recording our 'trons. You can get a copy of it here. His concise document covers everything from cleaning the 'tron before use, to getting good sound from a mic and a guitar amp, to judicious use of EQ and effects. Print it off and tape it to your mixer. If you've listened to Fritz's contributions to the Rime II CD, you know how well he gets things to tape (or disk). We're fortunate to have Fritz share his knowledge with us. If you've ever seen the neat "I Love Lucy" commercial on the Nick-At-Nite cable channel and noticed the wild version of the "I Love Lucy" theme song which spanned musical styles from the 50's to today---yep, that was Fritz! 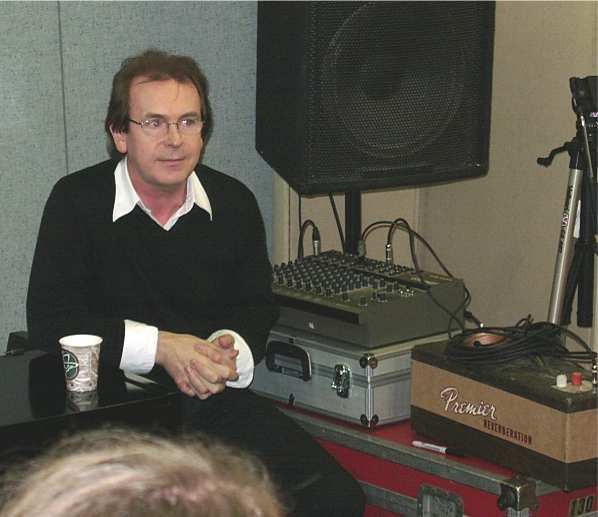 Our special guest Ian McDonald spent about and hour with us answering questions about his King Crimson days and life and times with the Mellotron. Although primarily a player of wind instruments, Ian had a way with the Mellotron, and this is no more clearly heard than in Epitaph on In the Court of the Crimson King. It's a masterpiece of 'tronning, but to Ian the Mellotron was really an extension of what he did with the wind instruments. As noted by others, the 'tron really isn't a keyboardist's instrument; it requires a lighter touch and a mindset more like that of an arranger. Thus Ian was able to get a great deal out of the instrument, as evidenced by his work with Crimson. A reserved but very nice fellow, it was great of Ian to chat with us and hang out with us for the weekend. Ian also lent his talents to producing brand new flute tapes for Streetly. They are quite different from the 'tron flute tapes we think of. Ian's sounds are lighter and have a wonderful vibrato. Be listening for them on 'tron recordings to come! Someone asked Ian what he thought of the 'tron fests. He smiled and thought back to William Shatner in that famous "Saturday Night Live" skit with the Trekkies. "No, I can't believe that anyone would still be dealing with these things. Would you guys get a life!"